TRAI vs Telecomwatch - Who reports correct revenue? Recently TRAI published quarterly revenue report for JAS'18 (July-August-September) quarter. This report is primary source of information for every telecom professional. However many of them also refer to Telecomwatch reports. During one of the recent discussion it became obvious to me that there are many telecom professionals who do not understand difference between these reports. Please refer this article for details. Recently conflicting reports in media on market leadership convinced me that the lack of understanding is quite widespread. Below is the link of two articles from same Publication. TRAI reports revenue under 18 different headings. However these headings can be clubbed primarily in four groups. Access Services: Revenue earned from wireless services given to customer. ILD (International Long Distance): Revenue earned from carrying international traffic. Others: Revenue from other services like ISP, VSAT etc. While TRAI reports revenue under all these headings, Telecomwatch only reports revenue from access services. To be fair, a telecom operator earns from all these services. Also their NLD revenue is primarily revenue earned for carrying their/other operators wireless traffic on their fiber. 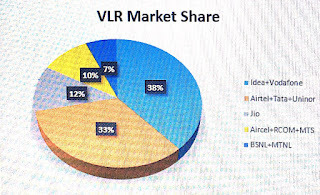 Hence market share should be calculated considering all type of revenue rather than only access revenue. Most importantly, while discussing market share one should be aware about which type of revenue is considered for calculation.